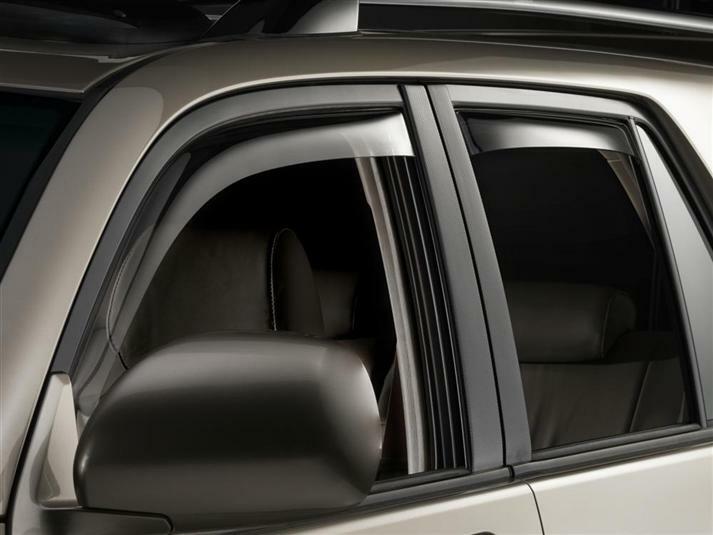 WeatherTech Side Window Deflectors are precision-machined to perfectly fit your 2004 Toyota 4Runner's window channel. These low profile window deflectors help to reduce wind noise and allow interior heat to escape. Our light tinted Side Window Deflectors are the only deflectors in the world made with a D.O.T. (U.S. Department of Transportation) approved glazing material. Available in light and dark tint for most vehicles. Designed and Engineered in USA – Handcrafted in Germany. This Window Deflectors gives your 4 Runner a New Look with Agressive style. Add Stone and Bug Deflector and your 4 runner will be like a real macho SUV. No grille needed or extra paint job etch. This was my 3rd SUV I've installed these deflectors on, after 2 years they still look new. Everyone calls these wind deflectors, I call them water deflectors, as heavy rains and water off the roof roll right off and stay outside when you crack open the window for fresh air, even in heavy rain. Super easy to install if you warm them in the sun first, and they snap right in. I also read this in the instructions I think, of course that was after I had already installed them, that’s how easy they are! Received my side window deflectors in about three days. The instructions could not have been easier, installation could not have been easier. The fit and finish is perfect. I am a happy customer and a WeatherTech customer for life. I have purchased several of the side window deflectors for all the SUV's and Trucks I have owned over the years. I will ONLY buy from WeatherTech! I continue to buy because of the quality and ease of installation on the side window deflectors. No need to use that UGLY two sided tape. On a recent trip across the country I stopped in the their store in Bollingbrook, IL. It's an adult candy store - Love it! Great product. Not only is very functional, but it makes the car look great. I love the side window deflectors! They were really easy to install, it took less than five minutes to install on all four windows.. They also look a lot better than the deflectors sold at the local auto parts stores. I am extremely satisfied with my purchase and will be using Weathertech again! I don't mind paying for quality and your window deflectors are definitely the best on the market. They look like they are built in at the factory not pasted on with scotch tape. Ordered on Sunday May 18 and delivered on Tuesday May 20 ( yes 2 days ). These fit like a glove, and look great. I ordered the dark for a black 2008 4Runner. Thanks WeatherTech! I needed to have a "LOOK" - My 4 runner had to have am image to live up to. So I bought the Window Deflectors and the Hood Shield and the Cargo Liner. Now it looks like a truck should look. It is a tough looking vehicle. It was a lot of fun getting this items and putting them on. It is unigue look and the only one on my block - makes me very happy. "Weather-Tech you rock"!